Special order product can take weeks to arrive. If you’re looking to update your living room fast before a holiday or special occasion choose an express item. These items can come to you quicker than others allowing you to eliminate the hassle of special order while still getting a quality piece that will create a living room you love spending time in. Sit back and relax in the comfort of this chair and let its warm, traditional appeal change your living room's decor. A plush back and seat cushion offer the utmost comfort while the rolled arms provide support. Nailhead trim and turned feet add delightful traditional details to the chair. Enjoy a comfortable and relaxing experience while you visit with family and friends, read a novel, or watch your favorite shows and movies. Pair with the coordinating quick ship ottoman for a great set. The Laramie Quick Ship Traditional Chair with Nailhead Trim by Broyhill Express at Colder's Furniture and Appliance in the Milwaukee, West Allis, Oak Creek, Delafield, Grafton, and Waukesha, WI area. Product availability may vary. Contact us for the most current availability on this product. Fabric Options Available for quick ship in specific combination shown. Seat Support Specially designed spring units are used. Wood accent chairs feature a latex webbing suspension system. All other styles utilize steel sinuous wire springs or steel coil springs. Warranty Lifetime warranties on frames and sinuous wire springs; 3 year warranty on cores, and fabrics have a 1 year warranty. The traditional appeal of the 5081 Laramie collection provides your home with a versatile look. 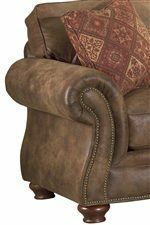 With brown faux leather or fabric upholstery and print accent pillows, you will love the appealing western style of the sofa, Queen Goodnight Sleeper sofa, loveseat, chair, and ottoman. Rolled arms, bun feet, and nailhead trim contributes to the classic styling. Complete your room with the coordinating Laramie Recliner for an ideal place to relax. Quick and convenient, this product line is a Quick Ship Program, allowing consumers to receive merchandise more quickly. Take advantage of this special order catalog, and enhance your home decor with exceptional styling today! The Laramie collection is a great option if you are looking for Traditional furniture in the Milwaukee, West Allis, Oak Creek, Delafield, Grafton, and Waukesha, WI area. Browse other items in the Laramie collection from Colder's Furniture and Appliance in the Milwaukee, West Allis, Oak Creek, Delafield, Grafton, and Waukesha, WI area.